If we could calculate the difference between what a problem could be and what it is, this one would set the curve. You have an interesting, concise, guessable hook here — how deep is the well? — that’s buried at the end of the problem, beneath piles of mathematical models the students don’t know they need yet. 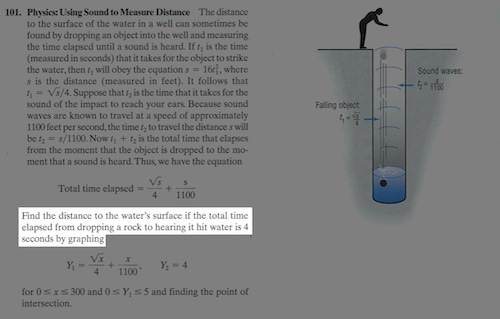 How about this: we film someone dropping a rock in a well of some known depth. Students hear the splash. Then students guess the depth. Now that they’re involved and want to know the answer, we can help them out with the models. 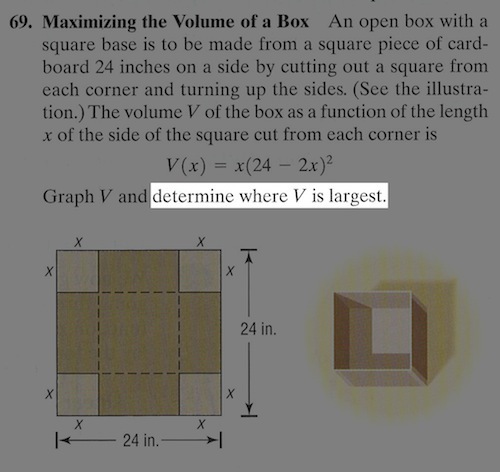 “Determine where V is largest” is how math publishers ruin the better hook, “What cut makes the biggest box?” In this case, I can’t see the argument against passing out cardboard to every student and having them create a box once (perhaps pouring something cheap and easily counted into the boxes to represent volume) before helping them out with the model. 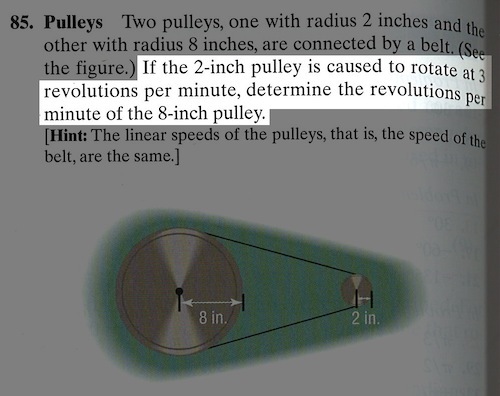 Here, the textbook gives the students the model without concern for whether or not they understand it. It’s mathematical mysticism. This is a nice hook. It announces itself quickly and clearly, without a lot of abstraction while at the same time uncovering some rich mathematics. What it needs, though are three videos, each with the footage sped up, each of the sun setting at the same location on the globe: one, from a stationary position facing West; another, from a car driving West; another, from an airplane flying West. 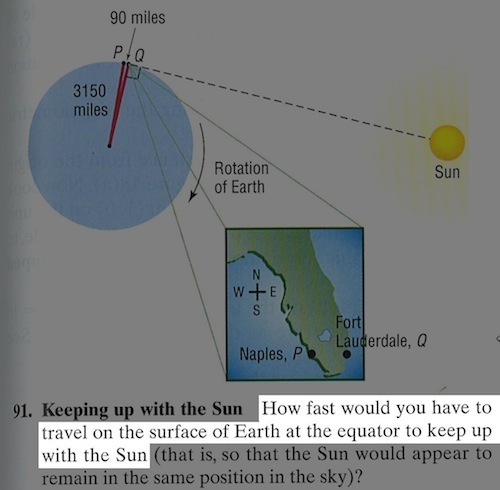 This is an effort at solving the confusion students may experience with this idea that the sun can … stay in the same place?! The students will notice in the videos that the sun sets “slower” as the camera moves faster West. What speed would we have to reach to keep the sun fixed in the sky? Fun hook for angular velocity and properties of circles right here. The thesis of this workshop is that the problem would be improved by a video of the system in action and by some way of verifying the number of revolutions after the students complete the mathematics. There is a nice hook but we should be concerned that we’re asking students to solve parts (a), (b), and (c) without any hint of where they fit within the larger context of (d): what’s the longest ladder we can take down the hallway? How much does motivation improve if we lead with that hook? If we show a video of someone trying and failing to take something lengthy through a turn in a hallway?